Meeting at an informal summit in the Bulgarian capital Sofia, the 28 EU leaders mandated the European Commission to defend the interests of European companies doing business in Iran, shrugging off Trump’s threats of possible sanctions. Trump announced the US would withdraw from the Iran deal earlier this month, saying the international agreement was a failure and an “embarrassment to the United States”. But Europe appeared to stand its ground this time. “On Iran nuclear deal, we agreed unanimously that the EU will stay in the agreement as long as Iran remains fully committed to it. Additionally, the Commission was given a green light to be ready to act whenever European interests are affected,” the chairman of the summit, European Council President Donald Tusk, told a news conference. On Wednesday, asserting Europe’s growing readiness to distance itself from its transatlantic ally, Tusk launched a stinging criticism of the US president, saying that “with friends like that, who needs enemies”. Earlier on Thursday, French President Emmanuel Macron, who had tried and failed to persuade Trump not to abandon the Iran deal, also asserted Europe’s readiness to dismiss US demands, saying companies should make their own choices. “International companies with interests in many countries make their own choices according to their own interests. They should continue to have this freedom,” he said upon arriving in Sofia. 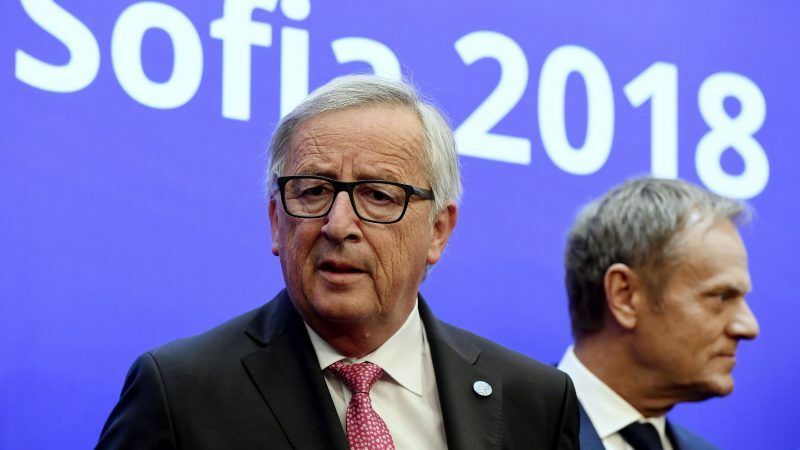 Jean-Claude Juncker told the same conference in Sofia that the EU was ready to start trade liberalisation talks with the United States in some areas if Washington gives permanent exemptions from aluminium and steel tariffs that are due to take effect on 1 June. The Commission will now seek to negotiate a permanent exemption from US tariffs. If it succeeds in that, an EU source told AFP, the EU was ready to take steps including “voluntary regulatory cooperation” with the US, and working on reform of the World Trade Organisation, after Trump claimed the US was unfairly treated. It was also ready to “improve reciprocal market access, for industrial products, including amongst others cars, and liberalisation of public procurement. Georgi Gotev contributed to this article. If EU leaders were adults, they would not act like a bunch of scared sheep. While Trump definitely behaves like the village drunk idiot, one has to admit that he has instinct for some things. Trade deficits of US are a global problem and need to be fixed. And this for sure will need balancing the trade with EU. EU has been keeping the EUR exchange rate artificially low for over 10 years now, as requested by France. So this leaves US no other choice, but to impose some tarifs on EU products. Trump is also right about the increasing military budgets. He is also right that Germany becomes more dependent on Russian gas. He is also right that the deal with Iran was problematic due to the 10 years limit. He is right about migrants to the US and this is unnerving to the leftists like Makron. These are all real problems and EU needs to acknolodge them and start solving them together with Trump.